“There are only a few carefree summers in your life. Don’t waste them interning at law firms…” So begins a recent post on Outside Magazine’s website that recommends working as a river guide before you grow up. 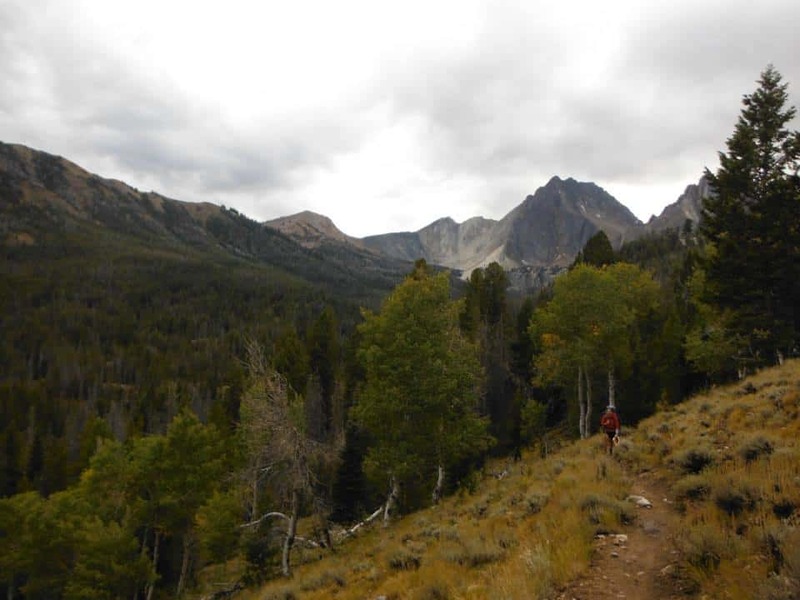 Among the various reasons cited for doing so, our faves include getting paid to float a river and vacation days that offer climbing, hiking, kayaking, and mountain biking. Additionally, it lists the romance potential as high. (Woooo, woooo!) We would also add to the list the great sense of camaraderie with your fellow guides. At first I was terrified. I really wanted to be this amazing raft guide. I saw the way the veteran guides controlled their boats with finesse and confidence, and the way they greeted their guests like old friends. However, for me, in the beginning, I could claim nothing even close to finesse and confidence. Before the season started we all took a Swiftwater Rescue course where we learned how to handle tough situations on the river. My least favorite part about the course was swimming through the class III rapid called, “Piece of Cake.” The fact that the water was 45 degrees didn’t bother me so much, it was mostly the crashing waves and huge holes that sucked me under that really got to me. The other guides seemed so brave, jumping in and making it through with ease. But me? I looked more like the person we were training to save. To be honest, I felt a little discouraged, but luckily I had awesome teammates who reassured me they were nervous their first year too. During the month of June, when us newbies were still training, every time it was my turn to guide my palms got sweaty and my arms felt a little shaky. I’d usually make it through the rapids all right, but I doubt it was pretty. Instead of making paddle commands like real raft guides do, mine came out more like questions. I’d be like, “forward three?” And the brave souls who agreed to raft with me while I was training would turn around and look at me with puzzled expressions. I quickly learned that doesn’t work. I also learned when headed straight towards a rock you gotta make a decision. Just pick one side or the other. Hemming and hawing over the right side or left side takes too long, and you usually end up smacking right in to it. Oh, those beginning days were fun. But after practice-guiding our stretch of river over and over (sometimes two to three times a day), I started to get the hang of it. What really instilled a lot of confidence in me- surprisingly- was falling out of a friend’s boat and swimming through a pretty rough section. Even though we swam through rapids during training, the river still seemed like this swift and strong force not to be touched, but only to be rafted upon. After falling in accidentally, and swallowing a ton of water, I realized you’ve got to work with the river, not against it. At that point, me and the river bonded. After that I stopped being so afraid, and started having fun. 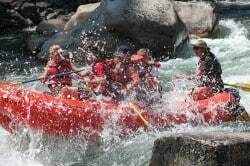 On my last day of training one of the veteran guides in my boat turned and said, “You nailed it!” after I guided us through the second class III rapid called “The Narrows.” I knew I had it down, and it felt so good! Instead of avoiding everything that looked like it might splash me, I’d head right for it. By the time I got licensed and started taking paying customers down the river, I felt like an all-knowing river wizard who got to bestow the wonders and majesty of the Salmon River to my fellow rafters. Although Emily is now back in Ohio, don’t be surprised if you see her next summer sneaking in one more summer of fun. It tends to happen that way. 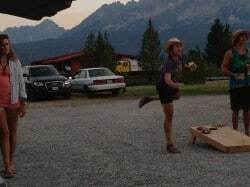 This entry was posted on Tuesday, November 5th, 2013 at 7:52 pm	and is filed under Guides, Salmon River, Stanley Idaho Rafting, Sun Valley Idaho Rafting, The River Company. You can follow any responses to this entry through the RSS feed.